"Pweew! Pweew!" Malusi's shrill whistling drives the sheep out of grandfather's kraal. By the time they reach the grazing slopes, the earth is hot beneath his bare feet. He keeps the sheep and goats from straying towards the deep donga, which is easy to fall into but hard to climb out of. You have to be awake, and you have to be brave, to be a herd boy. Malusi is a herd boy. It is a big job for a small boy, yet he does it well, no matter the danger. 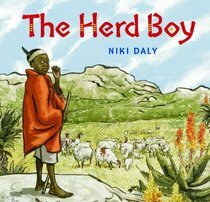 But he also dreams of being more than a herd boy someday: Malusi wants to be president. This simple but poignant story explores the idea that many great leaders have come from humble beginnings. Perhaps what gives someone the strength and integrity to lead well isn't so different from what it takes to be a good herd boy. Niki Daly is the award-winning author and illustrator of many books for children. He lives in Kleinmond, a small seaside town in Western Cape, South Africa, and often finds inspiration for his stories in African peoples and cultures.